Hello, ribbon-loving friends! It's Karen Letchworth posting today; and as you may have noticed, I love making mini albums out of paper bags. They're easy to make, a great way to showcase family photos on your coffee table, and make great little gifts. This one was created with the theme FAMILY in mind, and I used lots of great trims from Really Reasonable Ribbon. The cover of my album includes a felt flower with Natural Burlap String, and a length of Baker's Twine Diva Palos Verde Green Stripe. I also tucked in a 30 mm Green Paper Mulberry Leave. 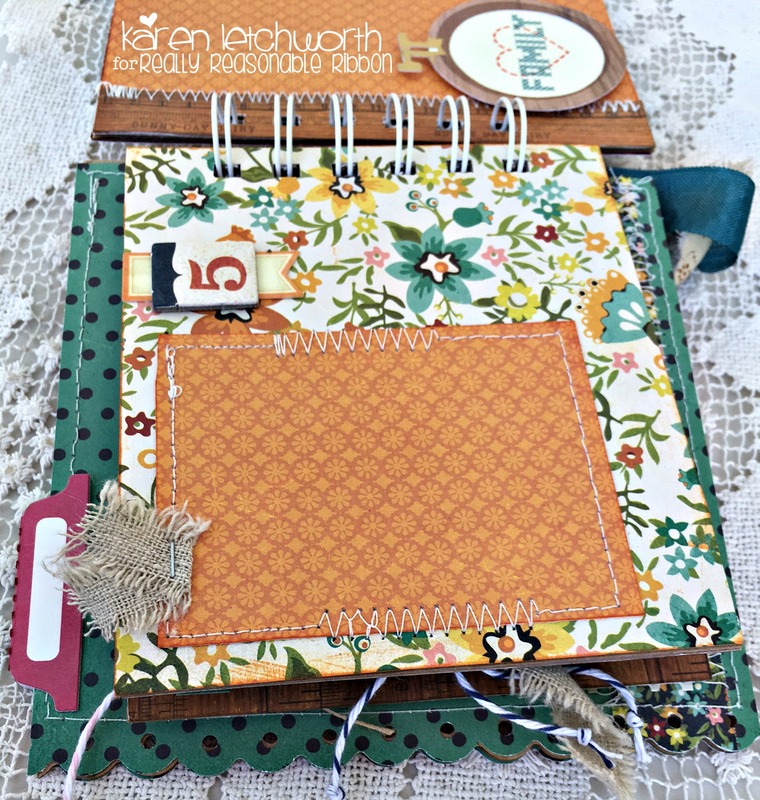 First, I covered all my paper bags/pages with patterned papers and embellished each page with coordinating stickers, stitching, journalling spots, etc. 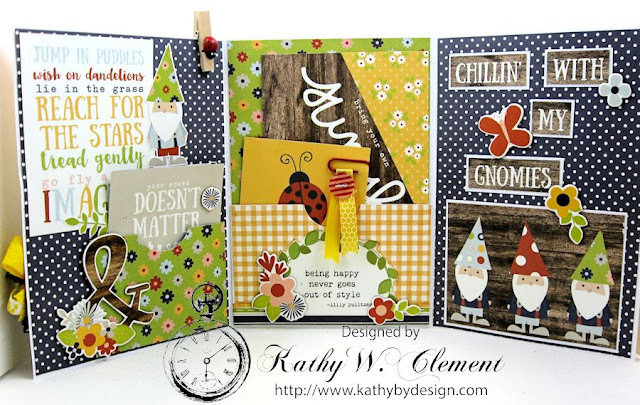 It was so much fun adding in some of my favorite RRR twines. 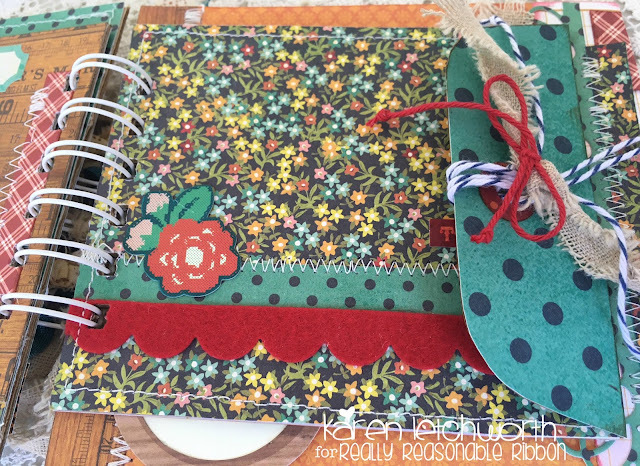 To see ALL the pages of this mini album, you're welcome to visit my blog, My Cup Runneth Over, but I will only be displaying here those pages using Really Reasonable Ribbon products (just to keep my post here from being super long). Below is Page 3, and it includes a journalling chipboard piece that's tied with Natural Burlap String and Cotton Candy Baker's Twine. Next, I'm sharing Page 5 of my mini album. There are several pages on the inside of my album that are smaller than the cover because I purposely used two smaller sized kraft envelopes. Each little envelope has a flap so that you can tuck photos, journalling, etc. inside as keepsakes. I'm sharing a close-up of this page to show you the sweet bow I made on the flap of this envelope. I used my hole punch to create a place to add some trims. I used two lengths of the beautiful Blueberry Baker's Twine (this color reminds me of a denim color.....super cute! ), and a length of Solid Red Baker's Twine, as well as a small torn piece of the 2 1/2" Cotton Blend Ribbon. Next, you will see Page 6 (above) which also has a small snippet (scrap) of the 2 1/2" Cotton Blend Ribbon. Really Reasonable Ribbon has so many great trims in every different width, fabric, textures, design, color, etc. You're always sure to find the PERFECT trim for any project. What not treat yourself today and stock of on some of the basics (i.e. Natural Burlap String and Baker's Twine) in your craft room. You're sure to LOVE everything RRR has to offer. 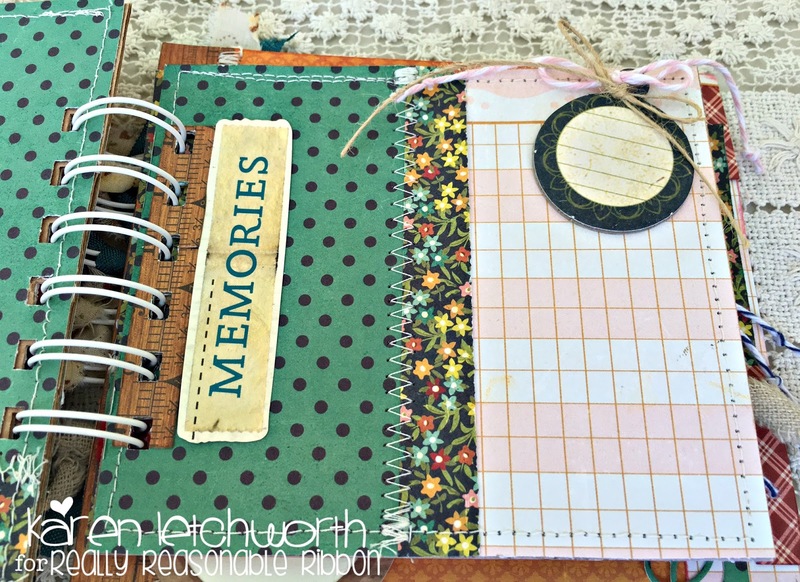 We also hope that you will stop back by the Really Reasonable Ribbon Blog often for more inspiration. 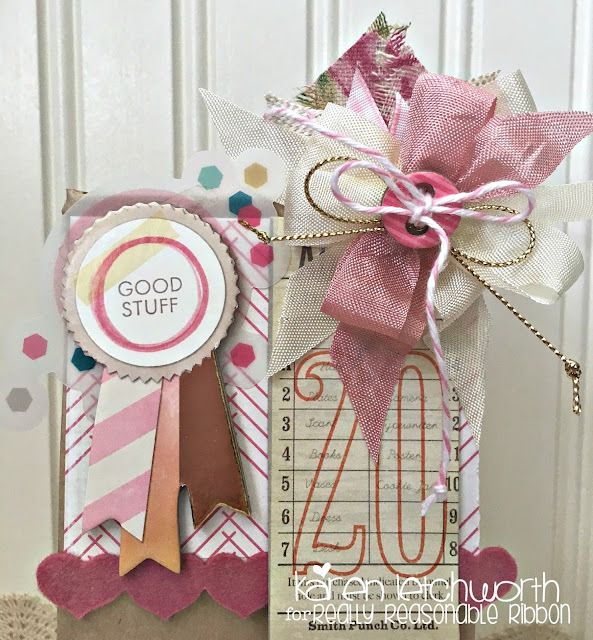 And don't forget that there is always a FUN CHALLENGE taking place where you can play along to showcase your ribbon and trim-adored projects. Thanks for visiting, and we sure hope to see you again soon. This is my posting day for Really Reasonable Ribbon. 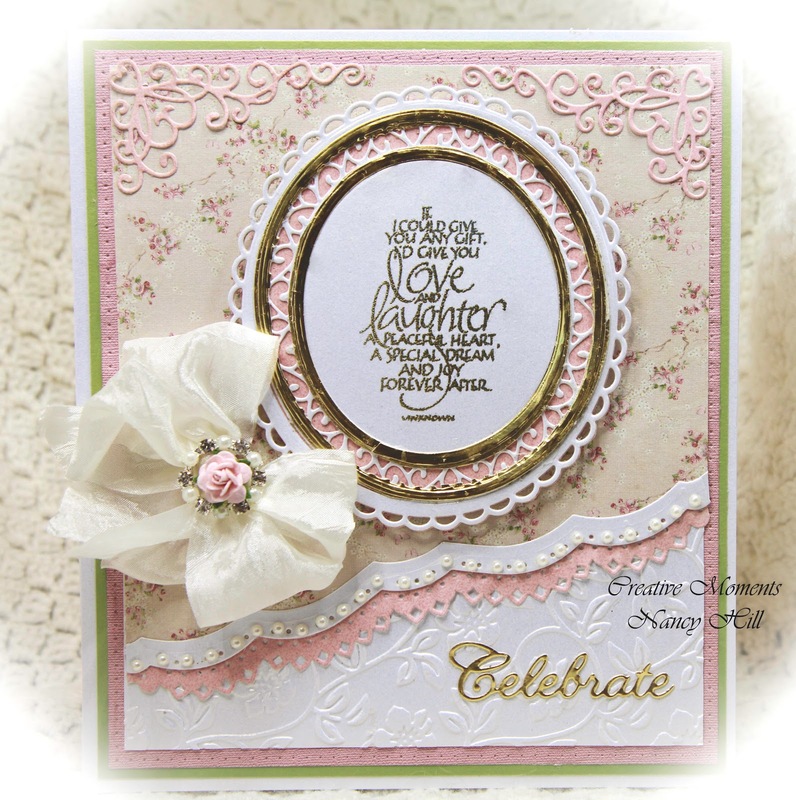 Hi, I am Nancy Hill and very excited to share with you my card with this gorgeous 1.5" wide May Art Ivory Wrinkled ribbon from Really Reasonable Ribbon with a rhinestone/pearl ribbon slider buckle and Wild Orchid Craft 15mm rose flower in the center. Of course, I wouldn't have made this lovely bow without the Zutter Bow It All from Really Reasonable Ribbon and the bow was attached using the 1" wide Scor-Tape. Sentiment - Sparkles and Sprinkles and printed off and embossed with gold embossing powder since my printer is pigment ink. Come join the fun with Really Reasonable Ribbon challenges and you might become the next winner. The Really Reasonable Ribbon design team really appreciates all of your comments as well as seeing your beautiful cards posted on these challenges. Our design team members have new cards posted each day on the Really Reasonable Ribbon Facebook of inspiring ways of using these gorgeous ribbons along with the other stunning flowers and supplies to give your card that "WOW!" look. I created this card using the Checkerboard Satin Tangerine ribbon that comes in the assortment or you can purchase it separately. It's just a gorgeous color!! Here is a closer look at that Gorgeous ribbon. I created my bow with the awesome Bow-it-All V3.0. like butter, no kidding. Those scissors are awesome. 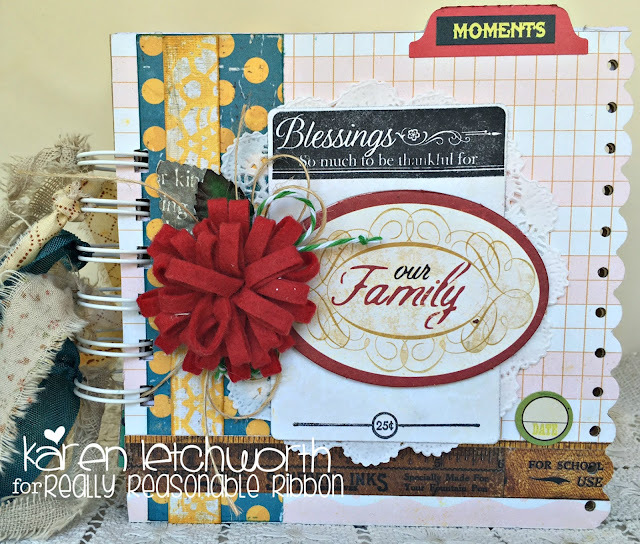 Thank you all for stopping by today.To see all the supplies I used you can head over to my blog A Creative Life. And head over o the Reasonable Ribbon Store to see more of these beautiful ribbons. I wish you all a great week and hope you also get to join in our up coming challenge so watch for that on Friday. Well, I am having some fun making shaker cards! I know I am slow to jump on the bandwagon, but I am on! This is my second attempt, and again, I have some naughty sequins and beads that want to stick to some adhesive I forgot to "erase." But I will never tell where! Only the recipient will know! and layered them on top of each other to ground my sea scene. 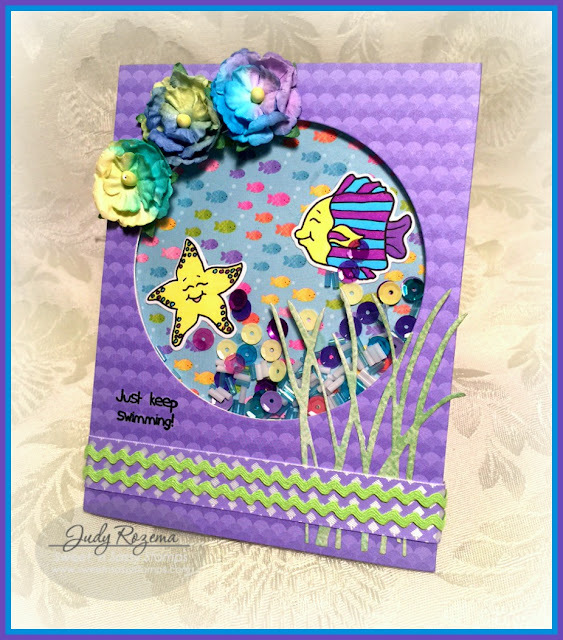 The Hyacinth matches the paper perfectly and I like how the ric rac looks like waves! Everything is held together perfectly with 1/4" Scor-Tape. The multi-colored Prima flowers fit in with the color scheme so well. I forgot all about a sentiment, and was really hoping that I could stamp it cleanly after the entire card was put together -- and it worked out! This is going to my daughter, who is almost done with Cosmetology School! Hello Ribbon Lovers! I have had the best time this month playing with the Citrus Ribbons in the June Ribbon Club Assortment! I have played and played with these pretty ribbons and used up just about every single scrap. I had just enough left to squeeze in one more June Ribbon Club project before we turn the calendar over to the month of July. 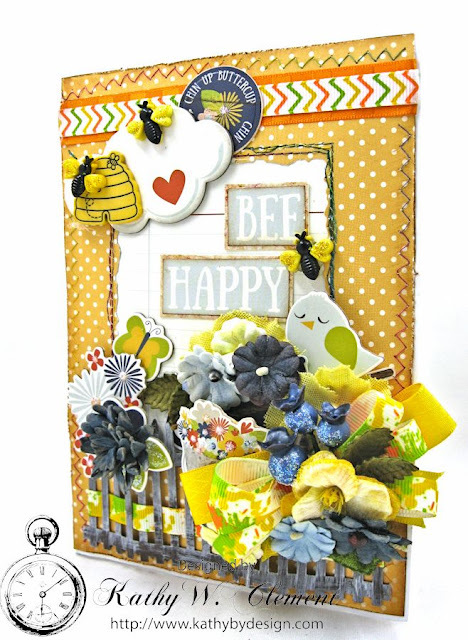 I think you're going to get a grin or two out of this "Chin Up, Buttercup" tri-fold greeting card made with Simple Stories Bloom and Grow papers. It's pretty hard not to smile when you're working with these sunshiny ribbons! Tangerine Delicate Stitched Satin and Citrus Striped Chevron Grosgrain were layered to create a header. I topped this with a little medallion that says, appropriately, "Chin Up Buttercup!" I wove Citrus Paint Splatter Grosgrain through the pickets in this rusted garden fence. Then I got busy layering up a double bow made with the last of my Maize Diamond Satin Ribbon and the Paint Splatter Grosgrain. I've been walking in my neighborhood every morning, and finding the most gorgeous mailbox gardens I've ever seen, and that inspired me to fill this fence in with a bounty of pretty flowers. Here's the inside of the card, just opening the first panel. And here it is opened all the way up. Honestly, I can't look at this card without grinning...it's those gnomes!!!! I stuffed the pockets with cute tags and postcards. Imagine how much fun it would be to receive this in the mail! It would turn a frown upside down in a hurry! That little snippet of Maize Honeycomb Satin was just the right size to slip into that red paperclip and top with a button. The card says, "Don't let the little things bug you." I loved this ribbon club so much that I kind of hate to see the month of June fade away. 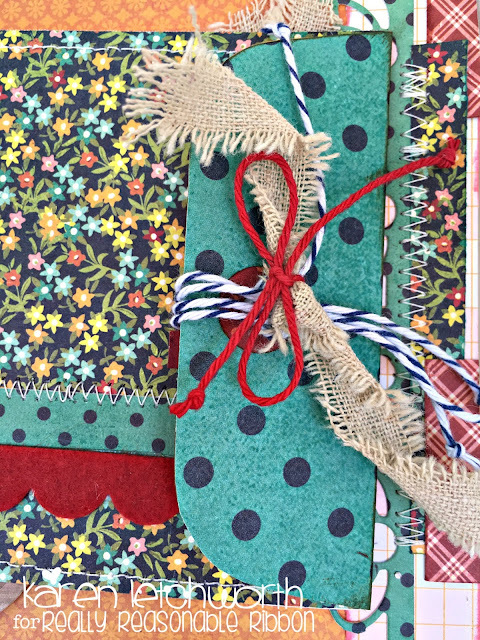 But it's all good....July brings a brand new ribbon club assortment with it, and since I've had a sneaky peek of it, I know it's going to be fun to play with, too! Happy Saturday! Hope your weekend is full of sunshine wherever you are. I have a few projects made for Really Reasonable Ribbon. Goodies made with your favorite gal pal's birthday in mind! Pretty in pink and oh so feminine. 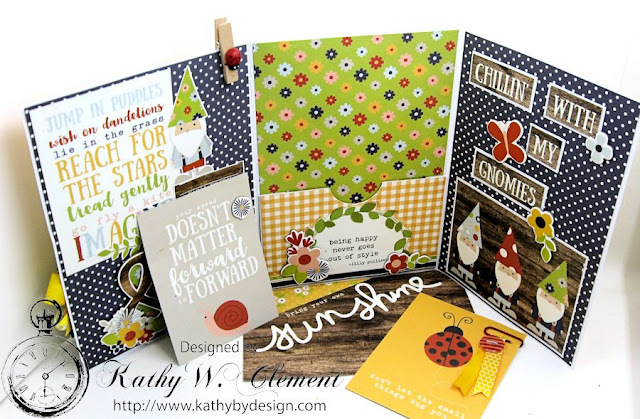 Some fun cards and a sweet pillow box to fill with candies or a small keepsake/gift. I used a combination of paper scraps, stickers, chipboard pieces, and more to create these sweeties. Along with Bay Leaf and Rose Petal seam bindings I also used cotton candy baker's twine. To really make these uber feminine (is that really a word)? .....I added some gorgeous blooms. Tea Roses in mixed pinks. 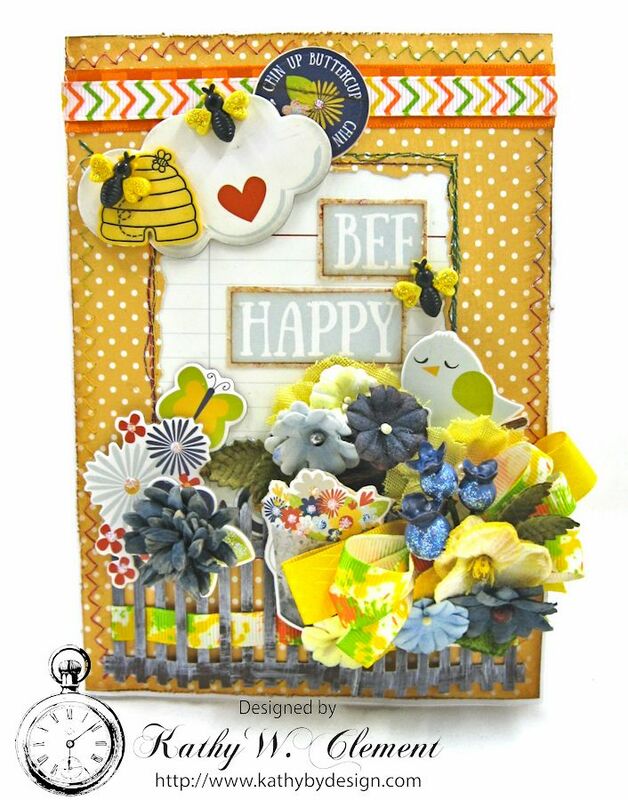 If you are just starting out with adding flowers to your scrapbook/card making arsenal, I really think this is a good place to start. These roses are so pretty and really work well with many projects. Now if I could grow roses that looked this good in real life....I would be in heaven!!! I also mixed a few cute wild orchid cosmos in white for variation. With all three projects I also added depth and dimension by using foam tabs from Tombow. I love these and go through them all the time. 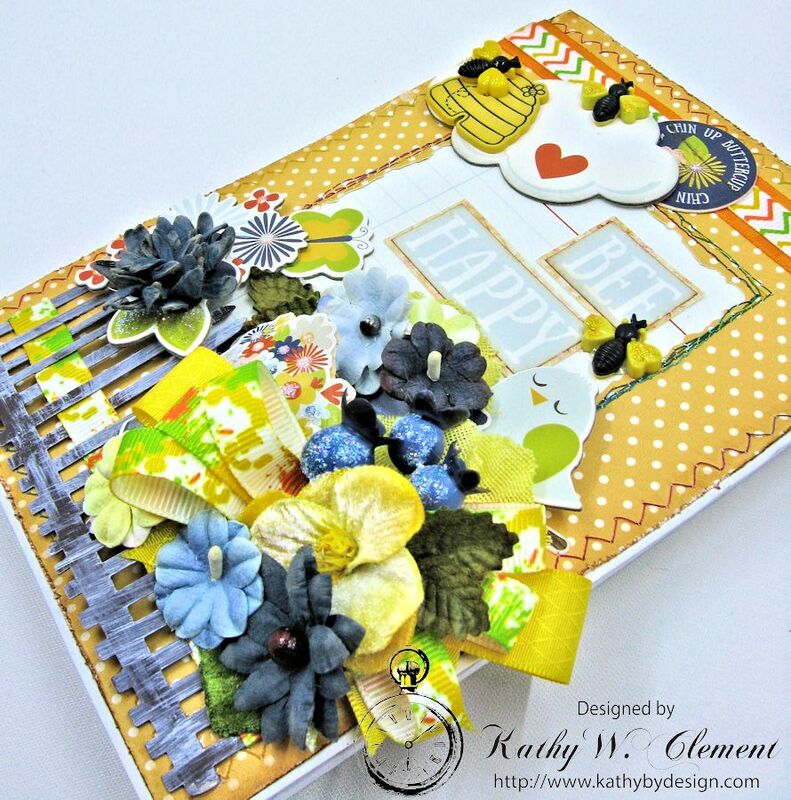 Hello everyone, Cheryl here today to share this SWEET card that I created for Really Reasonable Ribbon, using the Beautiful Ribbon, Seam Binding, and flowers that the RRR Store carries! I LOVE them all, and LOVE how my card turned out for today! This baby card was also created for my daughter, son in-law, & grandbaby Chloey! Can't wait to see her! Card Measures 5 1/2" x 5 1/2"
White Card stock cut at 5 1/2" x 11" then scored at 5 1/2"
Layer 1- 5 1/4" x 5 1/4" , then yellow design paper cut at 5" x 5"
Layer 2 Pink cut at 4 1/4" x 4 1/4" , then pink dp at 4" x 4"
Layer 3 - JustRite Hope Oval Frame Die cut in white, then a spellbinders die in pink, then spellbinders scalloped oval in white, and then the oval from Hope Oval frame cut in white, and airbrushed in pink copic. On top of that I used the sweet teddy from The Pixie Cottage Stamps. SU! Ticket- airbrushed with RV23, and YR31! Seam Binding- Really Reasonable Ribbons Moss Green, and ruched for the greenery. Bows- Really Reasonable Ribbon Satin 3/8" pink. Hope you enjoyed my post for today! Please leave a comment letting me know what you think! I always love reading them! Thank you!!! Hi friends. I'm sharing another birthday card today that was inspired by my favorite color - purple! It started with a gorgeous piece of gorgeous purple Indian Batik Cotton Rag paper that I 'had to have' and then I mixed in some of my favorite ribbons from Really Reasonable Ribbon and pretty dies from Cheery Lynn Designs. Perhaps a little bit of a dark color combination for this time of year, but I started with the purple batik paper which has a little gold in it and bada-bing, bada-boom, this is where I ended up. Sometimes you just have to go with it. My 'signature bow' was made created with Grape and Turftan Brown Delicate Stitched Satin Ribbon using my Bow-it-All V3.0. For a video tutorial on how to create this bow, please click HERE. Hey there Peeps! Today I am sharing a very special project I created especially for my Hubby for Father's Day ( it's a little late.) He and my younger Son went on an amazing adventure last summer that was a life changing experience for them. They spent 10 days hiking 91 miles in the mountains in New Mexico at the Philmont Boy Scout Camp with some of their best friends. Thanks to a great camera on his phone he was able to capture the amazing trip to share. I can't possibly scrap all the pics...but here are some good ones....especially of them together. I'm using Chocolate Brown Seam Binding, Diagonal Brown Stripe, Canvas Color Band Burgundy, all from Really Reasonable Ribbon and patterned papers from BoBunny and box and tags from Gypsy Soul. I added a smaller box on one of the tags to fill with smaller journaling tags.....which he can fill in with his favorite memories of camp. 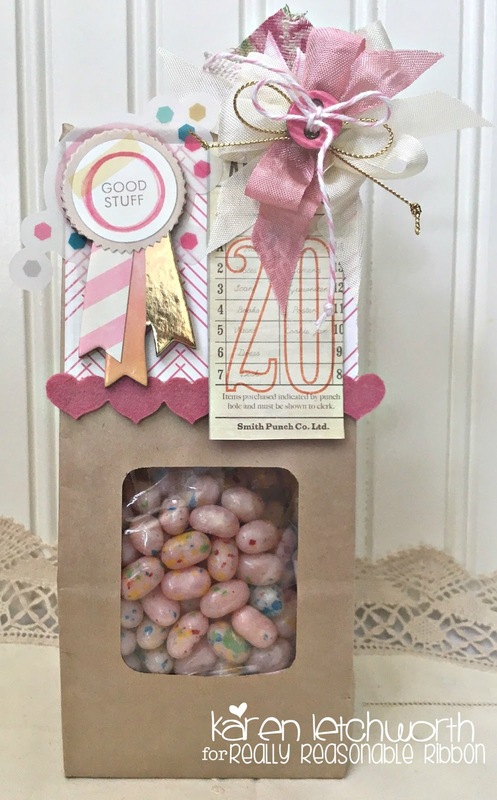 I started with a Coffee Bag (they're very inexpensive) and put some Tutti Fruti Jelly Bellies inside it. Once I folded the bag closed, it was cute. But I knew Really Reasonable Ribbon could help me make it even cuter! I added a small scrap of patterned paper, some tags and chipboard, and a felt heart border. It was starting to come together, but........I just KNEW it needed an amazing bow. I added two lengths of Cream Seam Binding, one length of Pink Aster Seam Binding, a piece of Metallic Gold String, and topped it with a button that was strung with Cotton Candy Baker's Twine. Then.....I added even more ribbon! Behind the bow, I added a small piece of 2 1/2" Cotton Blend Vintage Pink Floral Ribbon, a snippet of 3/8" Light Pink Gingham Ribbon, and a snippet of Burlap Pink Center Stitch Ribbon. I tried to take a close-up of the bow so that you could see all those gorgeous ribbons up close and personal. They're each fabulous alone; but together, they look SO sweet. As I've said so many times, that's one of the biggest things I LOVE about Really Reasonable Ribbon, and that's how well all the different ribbons and trims work together so beautifully. Thanks again for stopping by today. 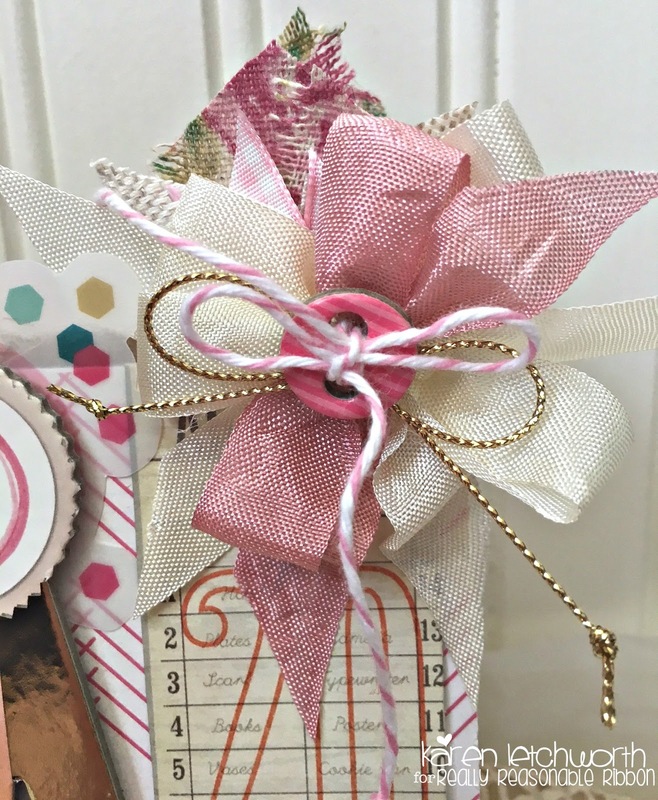 I hope this project inspired you buy yourself some new ribbons and trims to decorate your next gift-giving project. Really Reasonable Ribbon has everything you need to adorn your next project beautifully. 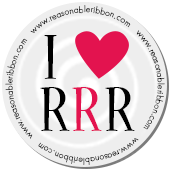 We also hope that you will stop by the Really Reasonable Ribbon Blog for inspiration each day, and to participate in our CURRENT CHALLENGE taking place now.